If you’ve been reading this blog for a while, you may remember reading my review of Sally Van Gent’s first venture into publishing, Clay Gully, Stories from an Apple Orchard (2013) and the follow-up feature in my Meet an Aussie Author series. Sally’s life has been a most interesting one, and her latest book, The Navy-blue Suitcase, Curious Tales from a Travelling Life fills in her backstory prior to making a new life for herself as a would-be orchardist of heritage apples. A man who would be so cruel to his wife is equally unkind to his daughter, but, without bitterness, Sally has the good sense to give up on him, as her mother should have done years ago. That’s my judgement from joining the dots: Sally never sits in judgement of either of them. Sally has the most amazing life. With her first husband Nick, she lives in Qatar, Mauritius, back in England in the Lakes District, Kuwait, Athens and Singapore. She brings up two kids including one with a very serious birth abnormality. There are whimsical anecdotes about each place, illustrated by sketches of wildlife, landscapes urban and rural, the children at play, curios, and an astonishing variety of houses. It’s in Singapore that her first marriage falls apart, but as with the failings of her parents there is no bitterness over that and no tell-all recriminations either. With her new husband she has just one stipulation, that he has to give up seafaring because she’s had enough of a peripatetic life. So they settle in Australia, though not without a few false starts. My favourite of her light-hearted anecdotes concerns the burglary when they live in a secluded rural property near Bendigo, and the dour Aussie insurance assessor raises a quizzical eyebrow over the claims for some very expensive jewellery. I’ve prepared a list of the missing items, at least the ones we’ve identified so far. It’s an odd mixture: the Malay knife that has gone from the wall in my husband’s office, his spare watch, an old camera. They’ve taken a four-pack of VB beer from the fridge and a bag of pens, Blu-tack and sticky tape that I bought for Nat, who’s about to go away to college. They’ve even taken the five and ten cent coins from his money-box. And of course there’s my jewellery. I’ve made detailed drawings of each piece and I hand these to the assessor. He flicks through the pages and then looks around the room. I can tell he’s taking stock of the peeling yellow paint, the hideous brown-striped curtains and the awful shag-pile carpet that was full of cat fleas when we moved in. When I catch his eye he looks away, but I can tell he is studying me too. He’s caught me at a bad moment. He arrived as I was digging holes in the front garden for the plants I brought with me from the other house, and I haven’t had time to wash. I’m wearing tattered jeans and a baggy old T-shirt that I bought in an op shop years ago. I liked this book. Sometimes memoir can be rather wearying, especially in its therapeutic manifestations when the author has a lot of misery or self-justification to get off her chest. But The Navy-blue Suitcase is not like that. It has optimism, humour, an indefatigable faith in a better future, and a powerful sense that life is what you make of it, no matter what cards you’ve been dealt. 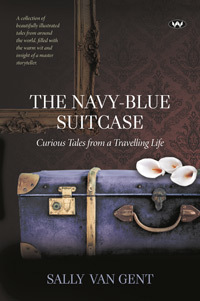 Available from Fishpond The Navy-Blue Suitcase: Curious Tales from a Travelling Life or direct from Wakefield Press. If I was reading a novel rather than a memoir, it’s the personal bits I’d be interested in. In this memoir how much of her inner life does author the leave out by glossing over her divorce? I’ve been divorced a couple of times (for failing to give up ‘seafaring’ – weeks away driving, in my case) and in both cases I was a wreck for a year. I guess ‘memoir’ covers a broad spectrum, from bland professional lives to intensely personal. Agreed, there is a huge range of memoir, and different types appeal to different people. I know, for example, two of my pet hates, memoirs of sad, damaged lives and memoirs of overcoming horrible illness, can be inspiring for some readers who like that sort of thing. But I don’t. I feel sorry for the people who write them, but I don’t want to read about them. Was it V.Woolf who said that women should write memoir? Like you it’s not my favourite genre but there are always exceptions. *chuckle* That sounds like the sort of thing Woolf would say.